After a weeks ‘lock in’ at Chongming Dongtan, the design work to create a series of lagoons, reedbed and saltmarsh was nearing completion. The final task was to present the plan to an assorted group of Shanghai officials, reserve directors and academics from the local Fudan University. Two hours ecological quizzing by the professors was somewhat challenging but seemed to go okay and then off to lunch with our very hospitable hosts. The custom appeared to be for each person considered to be a host to individually drink a toast to each guest with rice wine. There were a lot of hosts. Refills and toasters kept coming. Then the food, a lovely mix of local dishes; fish, shrimp, shellfish, succulent pork, duck and ‘poison fish’ soup. I like this sort of trip. With the job done, a bit of free time was in order and we were soon off on the 2-hour trip up the coast to the fishing port of Rudong. But not before we had a bit of feedback on a colour-ringed Black-faced Spoonbill I had photographed on the reserve a couple of days before. It was a second year bird, ringed as a nestling in Korea in July 2012. It wintered at Mai Po reserve in Hong Kong until May 2013 before turning up at Chongming Dongtan. On arrival at Rudong, we were pointed by local birders towards an area of coastal scrub good for migrants. 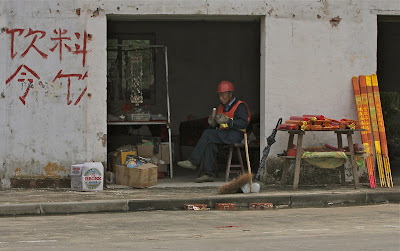 An old man was selling incense from a small brick building on the edge of the area. We saw a few Siberian Thrushes, Pale-legged Warbler, Asian Brown and Yellow-rumped Flycatchers, Richard’s and Red-throated Pipits headed south calling. 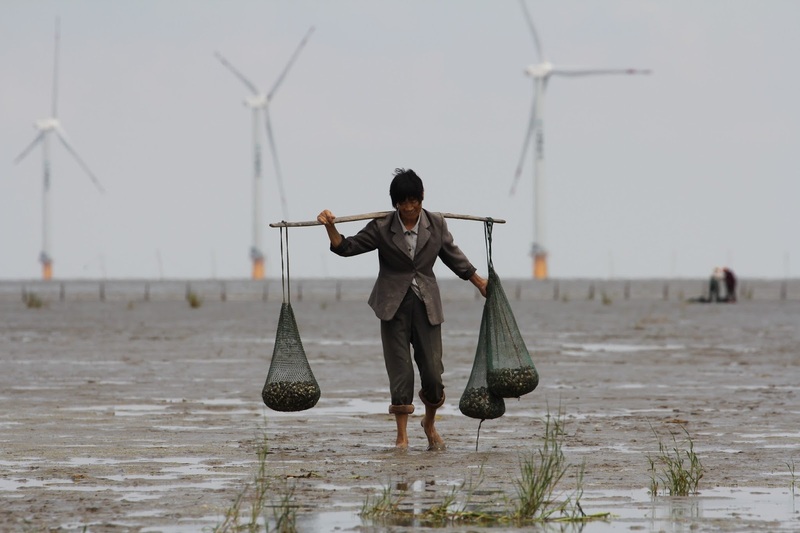 Then off to the mudflats and a walk out amongst the giant wind turbines, shellfish gatherers and assorted vehicles. Lots of Great Knot, sandplovers, stints, Broad-billed and Marsh Sandpipers, a few Nordmann’s Greenshank and then a small feeding flock of the target bird; Spoon-billed Sandpiper. Little is known about the feeding requirements of Spoonies on migration but Rudong is clearly an important site. Up to 50 birds had been counted here in the last week and every one we saw was in wing moult. By now the local press were aware of our presence and were hot-footing it across the mud. Close behind them were representatives from the local authority with an invitation to lunch; an opportunity to press home some points on shorebird conservation. 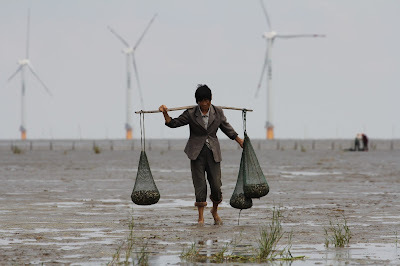 A major area of the Rudong mudflats is destined to become a port in the near future. Presumably the area amongst the turbines will stay, but still raked daily by hundreds of fishermen, pulling out ragworms and shellfish. The high tide approached, the sea rushed in and the waders poured over the sea wall to roost on recently reclaimed land; soon to be built on. As we returned for lunch, we passed the area of scrub. Half had been freshly bulldozed, as had the building the old man had been selling incense from. Just a pile a bricks remained. Such is the speed of development here. 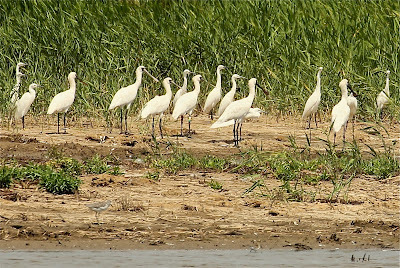 Pics: above - Spoony, Black-faced Spoonbill and Rudong mudflats. 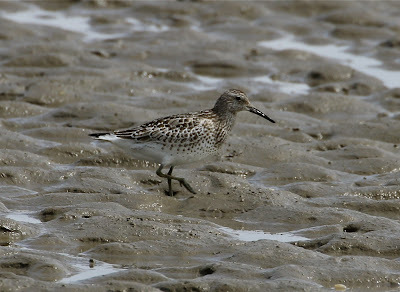 Below - Great Knot, Marsh Sand and 2 hours trading left. Work trips are not all there are cracked up to be. While Dark-sided Flycatchers call from outside and Eastern Crowned Warblers crash into the window trying to draw attention, we have to sit all day in a room discussing the finer details of Reed Parrotbill diet and Saunders’ Gull nesting requirements as we try to design a 2,500 ha nature reserve. 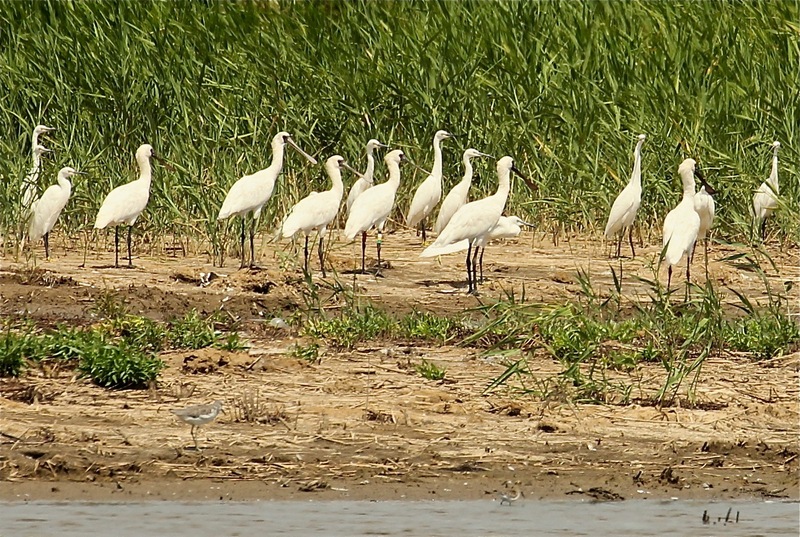 How can we provide more food for Black-faced Spoonbill? Yesterday however, we did get out early. Wading barefoot through the mudflats of Chongming Dongtan nature reserve, we talked to bird ringers catching waders and local fishermen catching shellfish. The ringers were catching and colour marking waders; with the aim of adding to the knowledge of how waders use the East Asian-Australasian flyway. 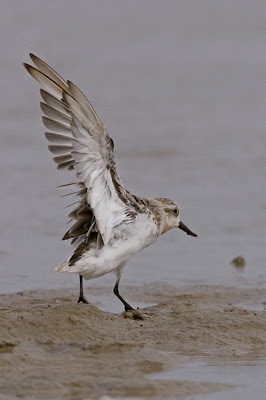 The catch was mainly Broad-billed Sandpipers, Long-toed and Red-necked Stints. The birds are caught by specialised bird catchers using clap nets with decoys. The fishermen were mainly sifting the bivalve Corbicula out of the mud to try and earn a crust; this beast also being a major food source of the Great Knot. But the introduced Spartina a vigorous grass growing to 2m tall, threatens both the fishermen’s livelihood and the Great Knot. Fishing for shellfish in the reserve seems a bad idea but the shellfish company also sprays out the Spartina that is marching across the mudflats at an alarming rate. 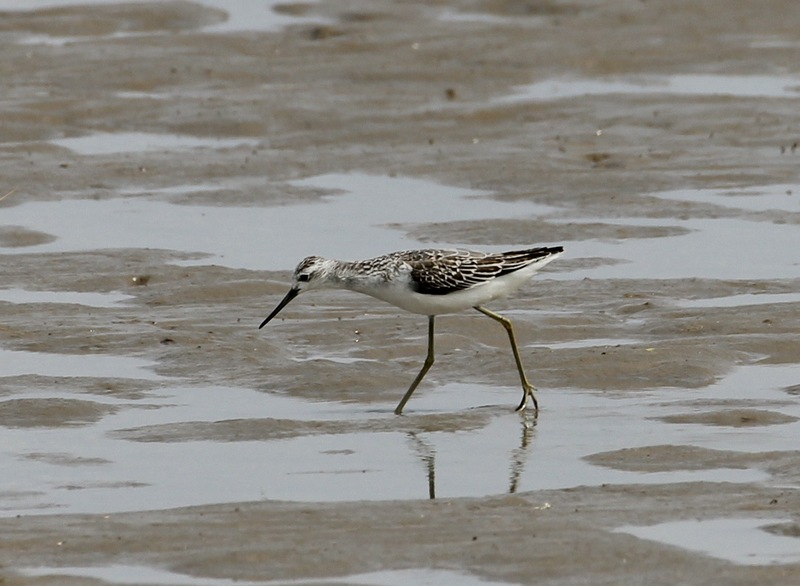 The mudflats held Greater and Lesser Sandplover and Grey-tailed Tattlers. All day long birds moved south, calling flocks of Wood Sandpipers, Marsh Sandpipers, Terek Sandpipers, Far Eastern Curlews, Great Knot, and Whimbrel, along with hundreds of White-winged Black Terns, Swallows and Yellow Wagtails. It was okay I suppose. 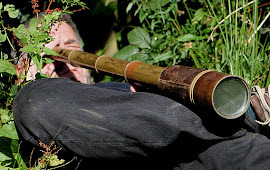 “What does the ecologist think” stops me daydreaming about yesterday and brings the mind back inside to the theory. 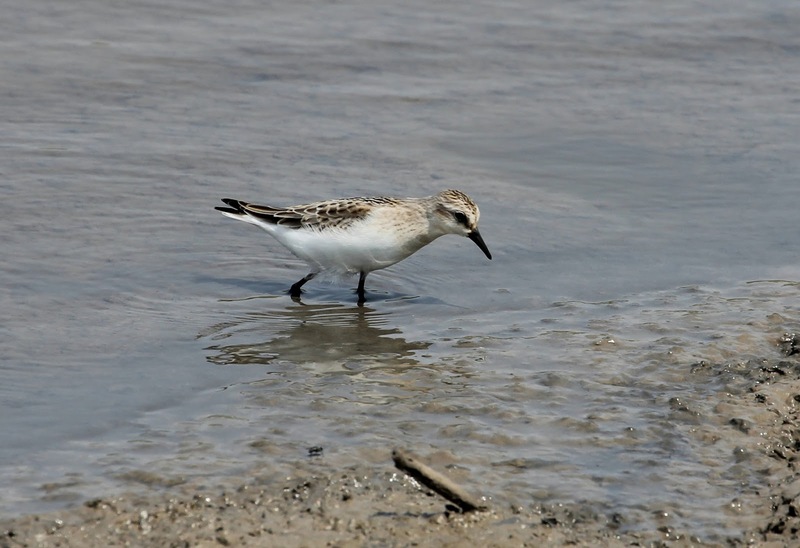 One of the reserve’s key species is the Marsh Grassbird, a skulking species with a distribution split into a number of isolated sub-populations across China, Japan and Korea. At Chongming, it is one of the few species found in the Spartina marshes. Can we remove the invasive Spartina without losing Grassbirds? Elsewhere it is found in more varied marshy grasslands including overgrown rice paddies. Breeding birds seem to prefer dense, mid-height reeds and grasses in shallow water for nesting, with some taller plants for singing posts. Now, where shall we create the islands for breeding Saunders’ Gull? Can we grow a sacrificial rice crop to lure the Hooded Cranes off the adjacent farmland? Outside it starts to get dark, the flycatcher rattles off to roost and Night Herons fly past the window. Kwak.